IMPORTANT: Green/White raglan sizes 2 and 4 are on back order and will not be available for the rest of the holiday. So sorry for the inconvenience. LAST ONE AVAILABLE THIS SEASON UP TO SIZE 6/7. 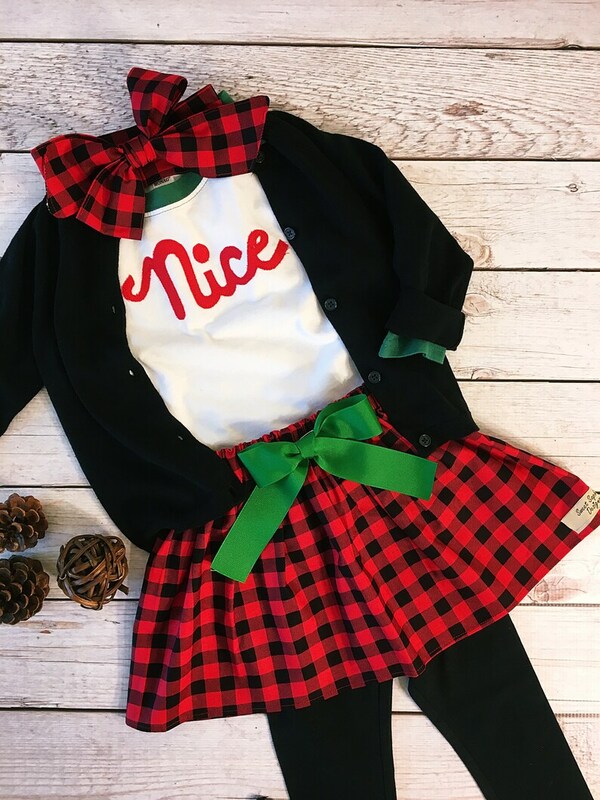 Darling Naughty or Nice Skirt outfit for your favorite girl. So sweet for little or big girls, two piece set is custom sized 0/3M up to youth size 6/7. Sorry but the black sweater and Leggings and not included nor available. You both will love the 3/4 sleeve raglan cotton top with our new fabric "naughty" or "nice" cursive applique. The buffalo plaid skirt is so sweet and comes with an emerald green detachable bow. ✨✨✨Such a fun set all winter long.